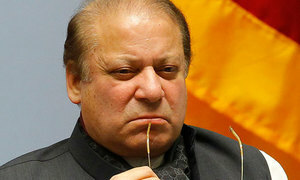 The act of lowering or scandalising the authority of the court is obstruction of justice and a punishable act. Prosecution presents two more witnesses before court. 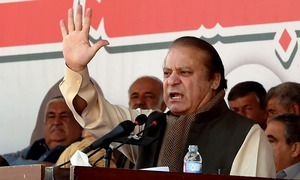 Apex court issues notices to defence, prosecution parties, including former PM Nawaz Sharif. 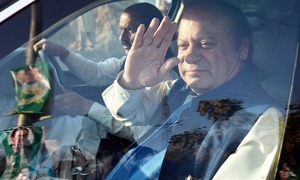 Dawn.com looks at 10 important cases that made headlines over the course of the outgoing year. 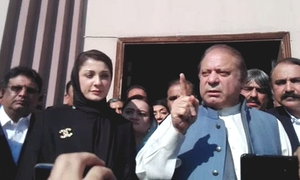 Zia headed the Panama Papers JIT and is believed to be the main prosecution witness in references against Sharifs. 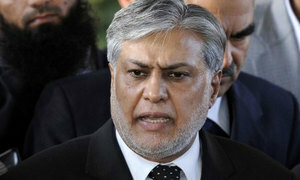 Guarantor Ahmed Ali Quddusi fails to present Dar before the court, submit Rs5 million surety. 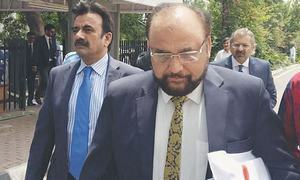 "The [Panama] JIT has given its opinion — tell us what the incriminating elements of your case are," says Justice Isa. 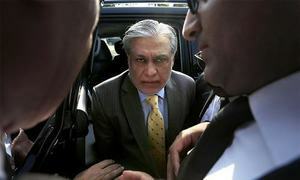 Court orders Dar's guarantor to present former finance minister before court in three days, submit Rs500,000 for bail. 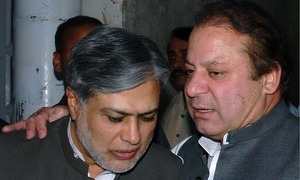 Judge orders that documents presented by bank manager be made part of case record in Azizia Steel Mills reference. 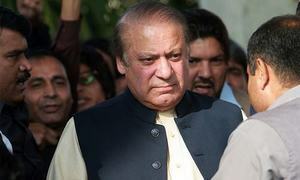 Nawaz's son-in-law seeks exemption from appearing before the court. 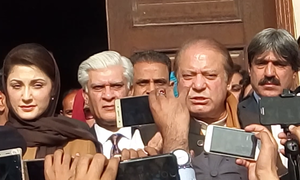 Court declares Hassan, Hussain Nawaz proclaimed absconders as witnesses begin recording statements against them. 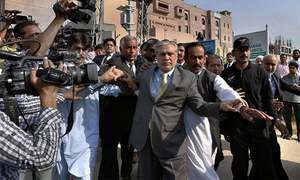 Former PM asks apex court to hear his ‘public interest’ petition; Dar challenges NAB court warrants for his arrest. 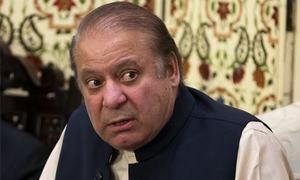 Ex-PM asks court to consider SC registrar's objections, CJP's ruling on matter void, set up bench to hear petition. 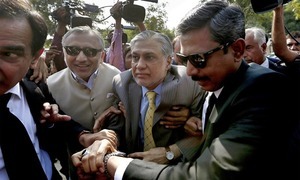 Notice put up outside accountability court warning Dar to appear before court within 10 days. 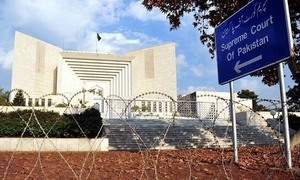 Supreme Court grills NAB prosecutor on why the reference was not pursued vigourously by the accountability watchdog. 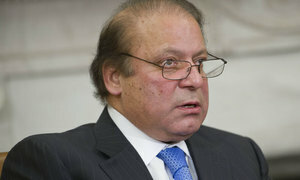 The former premier has sought suspension of proceedings until IHC announces verdict on petition to club references. 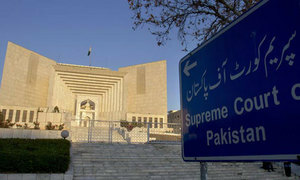 Bench reconstituted after Justice Khosa recused himself from the case; to be headed by Justice Musheer Alam. 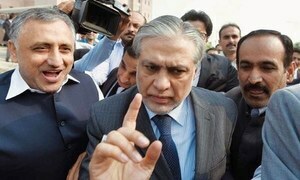 Dar's guarantor requests court not to confiscate his surety bonds worth Rs5 million. 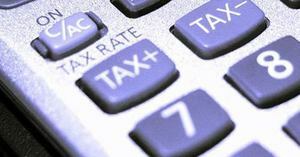 Separate references filed because properties were bought in different time periods at different locations, NAB says. 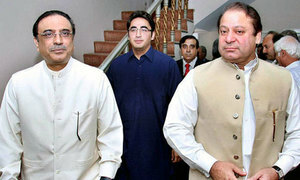 NAB prosecution presents two new witnesses against members of the Sharif family. Two prosecution witnesses appear in court to record statements. Former premier's lawyer argues references should be clubbed as accused, certain witnesses are the same in both. 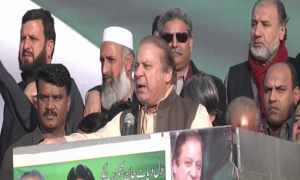 Ousted premier rails against SC verdict, says no court decision can break the ties between him and his supporters. 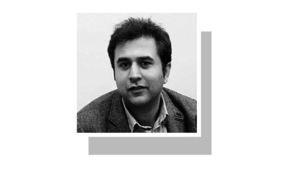 Mus­addiq Malik rejects reports that the ministry's work is being affected by Dar's absence. 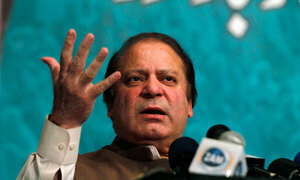 Sharif's sons, daughter and son-in-law may face travel restrictions.